Went to start the truck and it would not crank. No bulb check lights, no wiper, no cig lighter, no blower fan, no reverse lights. I do have headlights, horn, interior light, door chime. The ignition switch seems fine. I tested the continuity of the different positions with an ohm meter. Looks to me like the problem is that 1/2 the fuse box is not getting power. I think all that is not getting power is on the top row. Looks like two wires feeding power to it. One wire is hot, the other is dead. The dead wire shows continuity with the top row. I did an ohm test of the dead wire and the test shows it is grounded somewhere. The same dead wire shows in the 4 wire harness coming off the battery +. I unplugged the connector at the battery and found that the dead wire also shows a short to ground from that side. This strikes me as very odd. The problem is that I am not able to trace that wire. It enters the firewall on the passenger side, then looks like it re-appears coming out of the drivers foot well area. I am going to look at wiring diagrams now, but at the moment, I am thinking that I do have a short-to-ground on that wire, and that I may have to cut the wire where it goes into the fuse box and bring power to it from the battery. I had to abandon the truck so I don't have a lot of time to figure this out. How do I trace that harness? I don't know it is related, by I notice the gauges have been reading on the low side. Possible beginning of a short? No battery drain that I am aware of. I would have thought a short to ground would burn up something. Maybe it did blow a fusible link? Is there a link just for 1/2 of the fusebox? Last edited by chickenfriend; 03-31-2018 at 02:26 AM. Check the fusible links before you spend time looking elsewhere. That's the most likely cause. Thanks for your reply. I can't remember checking to see if I had power coming off the fusible links. There are 5 wires off the battery positive. One wire is by itself and the other 4 are bundled together and arrive at a harness connector a couple inches after the fusible links at the battery. I detached the connector and found that the white wire with a blue stripe (W/L) shows continuity with the truck chassis. Looks like a short-to-ground. There is a white wire with a blue stripe which is linked to the top row in my fuse box, maybe they are the same wire? I am looking at wiring diagrams right now. I find them very convoluted. Vehicle: 1997 D21 King Cab XE 2WD, 1998 Pathfinder. Do you have the FSM loaded to your computer? The PDF pages can be blown up and printed larger than life for easier reading. Four times normal is no problem, image resolution is there enough to see it clearly on paper. Check your relays, too. But it sounds like a main power lead off the positive side of the battery is blown. Whenever a Nissan loses all power to everything, or a whole block of stuff...it's time to start looking either up by the battery, or your relay box nearby. I found a bad relay once by just tapping on it gently with a screwdriver. One tap...everything came back on. Another tap...everything died. Replaced relay, no more problem. It's either that or something off the battery. Nothing else past the relays or the battery can cause so many electricals to cut out at once. That's been my humble experience anyway. 1997 King Cab XE, 5-sp, canopy, AC/PS, KA24E, 115,000 miles. Need a technical manual? Drop me a message. Chilton's for amateurs. I have a hard manual. Last time I checked, there wasn't an electronic version. The diagram is very hard to read without spending time with it learning the symbols. I am not sure it is 100% correct because of the wire colors I see at the fuse box. It looks like there are two feeders for the fuse box: a white wire and a white with blue stripe wire. The white wire is slightly larger than the white/blue wire. The white wire is live all the time. The white/blue wire is showing continuity with the fuses on the circuits not working, and with the frame of the truck. No way should this wire be showing a short. I was thinking about a relay going bad, too. I don't know how else that wire would be showing a short-to-ground unless a mouse ate through it behind the dash. If a relay is cooked, I could see that being theoretically possible: some part of the live circuit in it would be touching the ground side of the relay control. 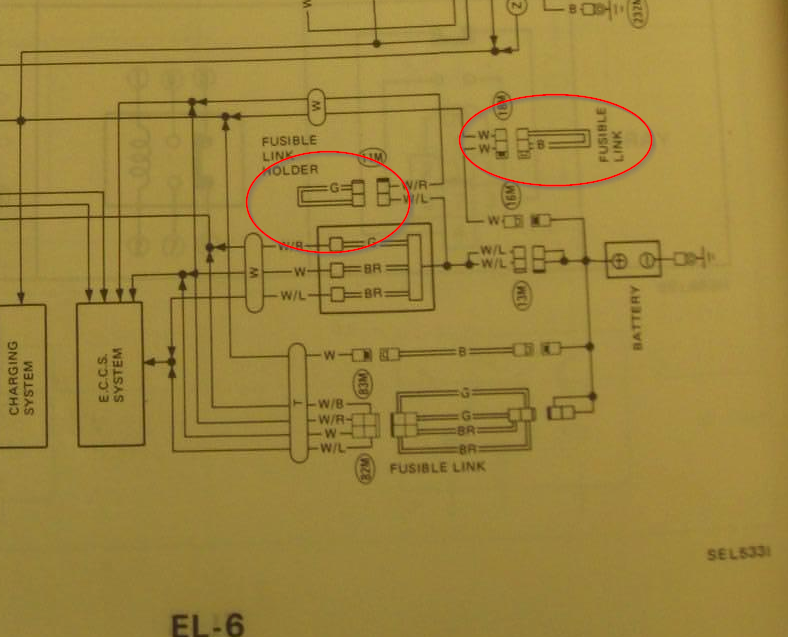 From the wiring diagram, it looks like two relays might be involved: the "accessory relay" and the "ignition relay". There are two relays on top of the fuse board. I don't know if these are the same. 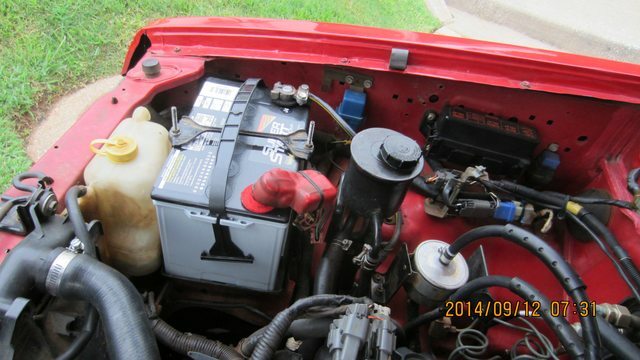 Then there is the row of fuses up near the battery in the engine bay, with "Main" and "Bulb check". I can pull these relays and test. I don't think I have spares. If I do have a bad relay, I hope the local auto store would have one, or possibly the dealer. Thanks for the input guys. 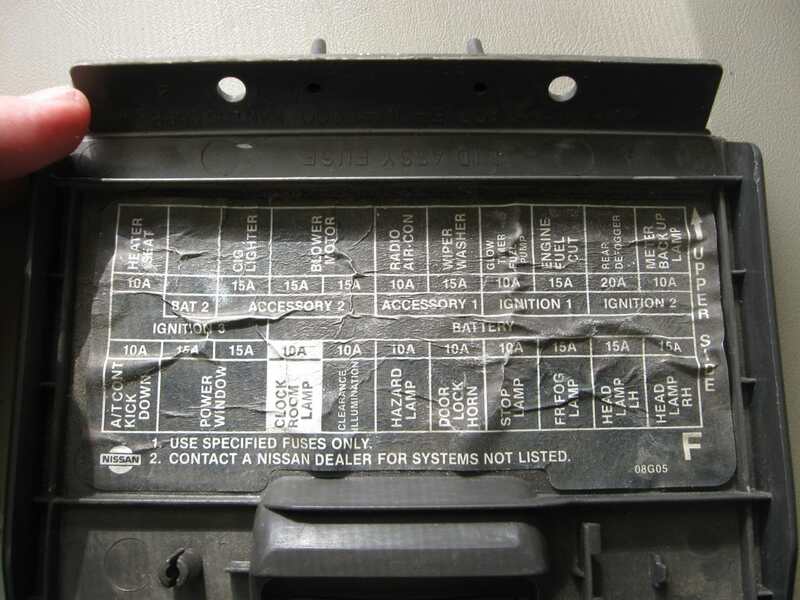 It does look like the "ignition relay" feeds the upper row of the fuse box: the dash, turn signal, and back-up lights fuse gets power from the battery side of the relay. The fuel pump and computer are tapped into the control side circuit for that relay. Last edited by chickenfriend; 03-31-2018 at 11:36 AM. Like you mentioned earlier, you have to know the symbols, and it doesn't make for "light reading", but the print is surprisingly clear. Like you have already pointed out, one wire (top in pic above) is White and the other is White/Blue. The White/Blue gets power from one of the Green Fusible Links. If your fusible links are good, I'd suspect you have a rat or squirrel making a nest inside the dash area of your truck, and it has chewed a wire into. 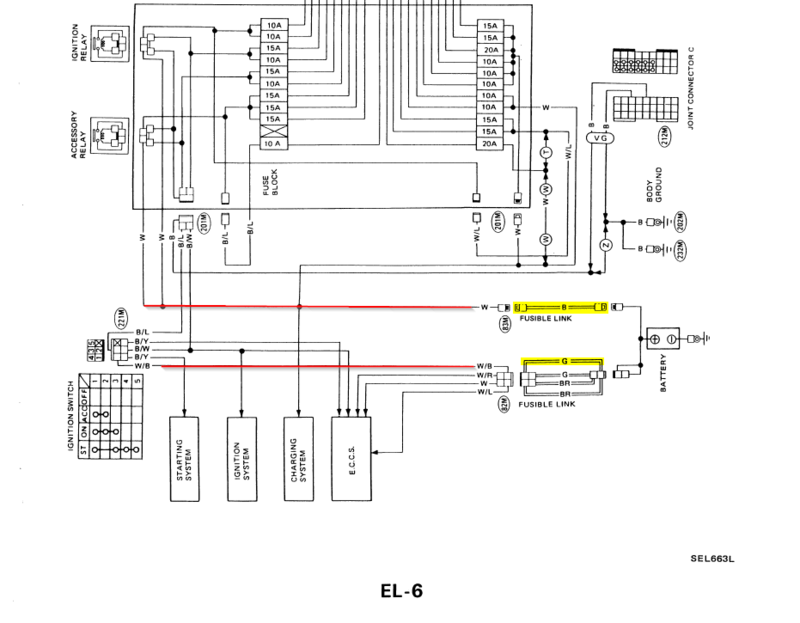 My main questions at this moment are, are the "Check Relay" and the "Main Relay", located in the engine bay, the same thing as "Ignition Relay" and "Accessory Relay" shown in the diagram? What are the two relays on the fuse panel above the top row? Here is my 1987 diagram from a hardcopy Factory Service Manual. It is a little confusing because of the layout, and that other vehicles besides the truck ("T" in an oval circle) are included. The White wire with a blue stripe is symbolized as "W/L" not "W/B" which is White with Black stripe. I might be able to use the old AC relay as test relay, if I knew where it was located. Just have not spent a huge amount of time with the electrical system of this vehicle. Really requires an immersion. Every manufacturer has their own way of diagraming and their own set of symbols. Last edited by chickenfriend; 03-31-2018 at 01:23 PM. From the diagram I just posted, it looks like the "Ignition Relay" and the "Accessory Relay" are relays in the fuse box, because there is a box line around them and the fuse block. I hope these are the standard Nissan relays. First thing I am going to try is swapping the ignition relay. I think I the local auto store has that generic relay. Need to carry a spare! I should also carry a spare interlock/starting relay, which is a little different design. Anyway, getting ready to leave for the truck. I am going to gather up some tools and test things, drive to where the truck is stranded and see if I can get it running without having to tow it home. Looking at the diagram again, it looks like the "ignition relay" and the "accessory relay" get their control circuit power from the ignition switch. There is a black wire on a connector to them which goes to two chassis grounds around the fuse box. Now, I had the cover around the hood lift off the other day, under which I think one ground is located. I will need to remove that cover and check that the wire didn't get knocked loose or something. Last edited by chickenfriend; 03-31-2018 at 01:39 PM. Here is a picture of this 1987 fusebox cover. I am holding it like you would see the fuses in the panel. There is some grouping of the fuses according to the diagram shown. "ACCESSORY 2", "ACCESSORY 1", "IGNITION 1", and "IGNITION 2" do not have power in the fuse box. All those fuses under "BATTERY" do have power. So, it would seem that BOTH the ignition relay and the accessory relay were not powering their respective areas on the fuse bars. Unlikely both relays would go bad at the same time? Seems both relays are not getting battery power on their switch side, OR the control ground side is open. I already established that the ignition switch is good so I think the relays are probably getting power on their control circuit. If I am not getting power on the battery (switch) side of the relays, maybe a bad fusible link? Otherwise, might be a loose wire on the ground for the control circuit of the relays. Last edited by chickenfriend; 03-31-2018 at 02:15 PM. As you already figured out, the 2 relays above the fuse panel are for the "Ignition Relay" and the "Accessory Relay". The "Check Relay" and the "Main Relay" are under the hood, in the engine bay. On my 1994, along the firewall, you can see the Clutch Interlock switch, the "Relay Bank" that has the "Check Relay" and the "Main Relay", and... some other relay (windshield wipers?). The "A/C Relay" should be mounted close to the other relay. If you do not have power to "ACCESSORY 2", "ACCESSORY 1", "IGNITION 1", and "IGNITION 2", then your Fuel Pump and ECU do not have power either. It really sounds like you have a burned Fusible Link - one of the 2 in the picture below. The Ignition Switch is complicated, and it does go out. I've seen 3 or 4 threads on here where that was the problem. All times are GMT. The time now is 03:04 AM.